But do you know these interesting fun facts? As mentioned above, the classic lasagna recipe may not have tomatoes in it, but it does have various cheeses. However, for this traditional recipe, we will only be using Parmigiano Reggiano. Now that’s settled, let’s proceed on how to make lasagna step by step. For this recipe, you can use dry or homemade lasagna sheets. And if you want to make an especially nutritious and more flavorful version, you can also use lasagne verdi, which also comes from the Emilia-Romagna region. In a pasta pot, cook the lasagna sheets in boiling water until they’re al dente. Set aside. In a saucepan, heat the extra virgin olive oil in medium heat, and then add the chopped carrots, celery, and onions. Cook for about 20 minutes. Next, add the ground pork and ground beef. Cook in medium heat until they’re dark brown. Pour in the white wine. Cook until the wine evaporates. Add the tomato puree and water. Simmer over medium-low heat for about 2 hours, stirring occasionally. If the sauce dries up, add more water. When the sauce is cooked, make sure it is so thick that almost all the liquid has evaporated. Then, add salt and pepper according to your preference. Next, add 1/4 cup of fresh milk. This is to lessen the acidity of the tomatoes. Mix well and simmer for a few minutes. Set aside. Meanwhile, you now make the besciamella sauce. First, sift the flour to make it easier to mix with the other ingredients. Next, melt the butter in a saucepan. Once it’s all melted, remove from heat and put in a mixing bowl. Add the sifted flour and mix with a whisk. Make sure there are no lumps. Put the butter and flour mixture in a saucepan and cook in low medium heat until it becomes a bit brown. In another saucepan, heat the remaining 1/4 cup milk and add some nutmeg powder and a pinch of salt for flavor. When the milk is hot, pour it in the saucepan with the butter and flour mixture. Under low heat, mix all the ingredients with a whisk. Make sure the sauce is creamy and smooth. Cook for about 5 to 6 minutes, stirring frequently. Set aside. In a baking dish or lasagna pan, put a thin layer of the besciamella sauce on the bottom of the dish. Then, place a layer of lasagna on top. Take note if you set it vertically or horizontally. Pour another layer of besciamella sauce on top of the pasta sheets. Next, put a layer of meat sauce and then spread Parmesan cheese on top of that. So the layers after the besciamella sauce at the bottom of the pan should be: lasagna sheets, besciamella sauce, meat sauce, and then Parmesan. For the next layer of lasagna, lay it in the opposite direction so it will be in the crossed position with the previous lasagna layer. So if you placed the first lasagna sheets vertically, set this second layer horizontally. Repeat the layers until all ingredients are used. Just make sure to have enough sauces and grated Parmesan for the top layer. For the top layer, it should be the meat sauce and then the rest of the Parmesan cheese. Cover the pan with aluminum foil and bake in preheated oven for 25 to 35 minutes. Next, remove the foil and bake for another 5 to 10 minutes. Once you see a light golden crust on top, then your lasagna is perfetta. Let it stand for 10 minutes before you cut and serve. Buon appetito! Thanks, in part, to a certain chubby and lazy orange tabby who hates Mondays, almost everyone in the world knows what lasagna is. Indeed, it is considered to be one of the most popular pasta casserole dishes in the world today. 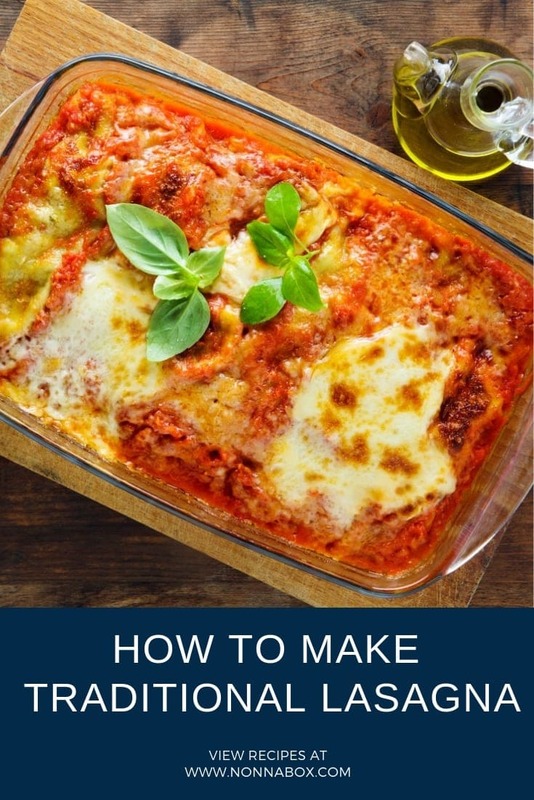 However, lasagna’s popularity is not only because Garfield loves it but also because it’s considered to be quite easy to prepare, even for a novice cook. And it’s exceptionally delicious to boot. It’s so easy to make that almost anyone with an oven can cook (and bake) lasagna. 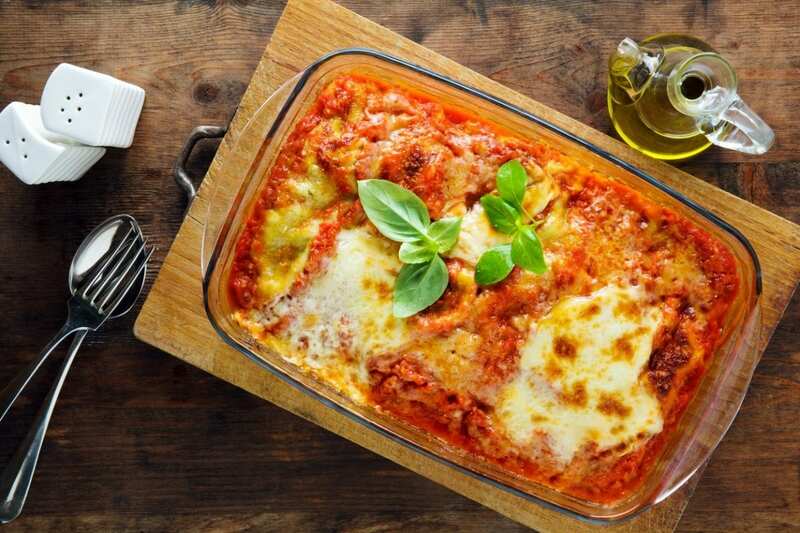 Let’s dive into some history about this delicious Italian traditional dish and how to make lasagna the proper way in the recipe at the bottom of the article. But as much as you’re aware that you shouldn’t mess with Garfield’s favorite food, how well do you really know this delectable pasta? Lasagna is considered to be one of the oldest types of pasta in the world. How do we know this? Well, let’s trace the origins of this unique pasta and the dish of the same name, back to their roots, shall we? 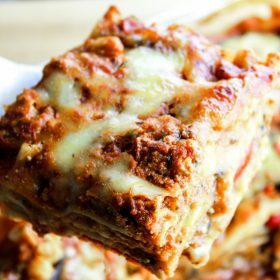 Attributed to have come from the province of Naples in the Campania region, historians are not 100% certain when the lasagna was first created. During the Middle Ages, however, a cookbook called Liber de Coquina contained a recipe that resembled the lasagna of today. Liber de Coquina is one of the oldest cookbooks from the medieval period and it was published around the 13th to 14th century. Historians believe it was written by an Italian from Naples, hence the conclusion of where the recipe originated. There’s also another story that researchers have found a British cookbook, which was discovered earlier than the Liber de Coquina. They say it contained something that also resembles a lasagna recipe. But whichever of the stories may be the pasta’s true origin, most historians agree that lasagna had become one of Italy’s traditional dishes by the late 1300s. Historians theorize though, that the original lasagna recipe didn’t have tomatoes. Why? Well, because tomatoes weren’t cultivated in Europe at that time. Their research states that tomatoes were first brought to Europe, particularly to Sicily, by Spanish explorers from South America only in the 16th century. But even though the original recipe didn’t have yummy tomatoes, it did contain various kinds of cheese. Lasagna, unlike spaghetti or fettuccine, is a wide flat pasta sheet. But like most pasta, it is made of durum wheat and eggs. There are generally two types of lasagna: flat and rippled. A pasta casserole dish of the same name has lasagna as one of its main ingredients. Lasagna, the dish, is made by alternating layers of pasta sheets and sauces. The traditional sauce for lasagna consists of besciamella, ragù (hint: you can use ragù napoletano as well), and Parmesan cheese. Other classic ingredients of lasagna are tomato sauce and meat. It can be perfect both as comfort food or main dish for a fancy dinner party. Lasagne alla Bolognese is a popular variant of the classic lasagna dish that is associated with the Emilia-Romagna region in Italy. This yummy pasta casserole might be a common dish in the U.S. but in Italy, it has always been regarded as a dish for special occasions. There are several stories as to how lasagna got its name. And actually, there is some debate on whether the Greeks or the Romans were responsible for it. One theory is that it comes from the Greek word laganon, which was a flat pasta dough that was cut into strips. Some also say that it comes from the Greek word for a flat unleavened bread called lagana, which was usually served on a certain Greek holiday. And yet another theory is that it comes from the Greek words lasana or lasanon, or the Latin word lasanum, all of which mean “chamber pot” or “container”. “lasagne” to refer to the food. And in the old days, the word “lasagna used to refer to the pot in which the dish was cooked. You can bake lasagna without pre-cooking the pasta sheets. You just need to make sure there’s enough moisture in the dish when you bake it. Types of lasagna used in Italy depends on where you are. Flat lasagne are used in northern Italy while the rippled ones are used in southern Italy. There are several versions of lasagna. Some put mushrooms, others put Italian sausages. In fact, the general idea when cooking lasagna is that as long as you can pile them up with the classic ingredients, you can add them to the mix. A bit of caution though, there’s no guarantee that your own “unique” will taste as good as the classic lasagna. Lasagna has its own holiday. Yep folks, every 29th of July is considered National Lasagna Day. You don’t really need to have an oven to make lasagna because a dishwasher can also get the job done. Just assemble the ingredients in a dish as usual, cover it with foil, program the dishwasher to normal cycle in “heated dry” and “sanitize” settings, and you’re all set. Although, why anyone would prefer to make it in the dishwasher instead of in an oven, we have no idea. Now, after metaphorically munching on all these interesting facts, above is a recipe to give you some idea of how to make lasagna.